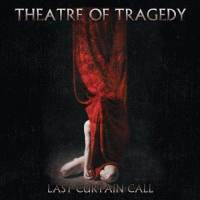 THEATRE OF TRAGEDY is a band that wrote a history of its own during these last eighteen years. Unfortunately, after their “Forever Is the World” tour in 2010, the band decided to officially call it quits and focus more on their personal lives and families. The closure of their career comes with the release of a DVD/CD of their final live show on October, 2nd in 2010 in their hometown of Stavanger, Norway. The DVD comes along with a CD version, with 10 songs, and at the same time, there is also a double live CD (of 16 songs) for the people that prefer audio only .In “Last Curtain Call” there is almost a song from every one of their albums. Having such a unique and strong track list we can definitely say that it is more of a greatest hits package than a live album. For example, we have “A Hamlet For A Slothful Vassal” from their first album, three songs from “Velvet Darkness They Fear”, “A Rose For The Dead” from the same album, “Venus” from “Aegis” and three songs from “Musique "Fragment", "Machine" and "Image". Also tracks from their last album and “Storm” are included too. As the album’s title states it’s a final curtain that falls down, a chapter that closes leaving a significant mark in the Doom / Gothic Metal music. The reason that I always admired and listened to TOT is the fact that their work has always been a little bit controversial, touching different musical realms such as electronic music. This live album is a great representation of their history, with a production so close to perfection that leaves you wondering if we are really talking about a live recording. A big bravo has to go, also, to Nell Sigland that effortlessly proves her quality as a vocalist, performing quite as well (even better I dare to say) songs from the Liv Kristine- era .In my humble opinion, there is no point in rating an album like this one. It is a great farewell for us fans, including myself, for a band that influenced so many others and made the female-fronted bands a trend in the Gothic Metal scene.